It may be the last minute but there is still time to craft the perfect gift for that someone special. 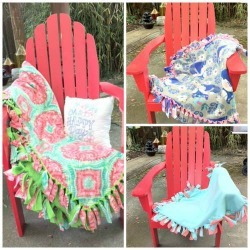 The gang at Craftster will show you how to make a No Sew Blanket with their Craftster Quickies video. Assembling the blankets is so easy and quick that you can produce several in just a few hours. Show off your charitable side by making blankets for pet rescues, homeless shelters and hospitals. Wrap your sweetie up in luxury with their very own fleece cover. Our Handmade Holiday Gift Guide will help you create a gift that comes from the heart not only during the holiday season but all year round.